Blekko, the perky little search engine startup that lets you customize your search results, is taking the fight against web spam to a new level. It already allows searchers to mark results as spam and keeps a spam clock that counts how many spam pages are on the web (743 million and counting). Now it is about to block content farms like Demand Media’s eHow and Answerbag entirely. The top 20 sites its users have marked as a source of web spam will now be blocked (see full list below). Concerns are rising that spam is increasingly taking over search results. So much so that Google recently vowed to become more vigilant and downgrade content farms specifically in search rankings. Groupon gets all the attention, but another deal juggernaut that should be on your radar is New York City-based Next Jump. The company runs group discount shopping programs for 90,000 corporations and organizations, and powers MasterCard’s loyalty rewards program. Investment bankers are sniffing around. Merchants offer deep discounts through Next Jump as a way to acquire new customers (read my initial profile for more info). Last November, Next Jump started to let people buy things with loyalty points as well. Its 60 million active shoppers are now spending 100 million loyalty points every month (each loyalty point is worth a penny, so that comes to $1 million a month). Before November, they were only burning through about 1 million loyalty points per month. CEO Charlie Kim believes that combining deep discounts with loyalty points is the best way to keep consumers coming back for more. Next Jump is on a hiring spree. It just hired its first chief financial officer, ex-Googler Angus Kelsall, who used to run Google’s international businesses in Europe, the Middle East, and Africa. Another new addition to the executive team is Andrew Beranbom (he once ran Yahoo Shopping), who will take on the roles of chief social officer and VP of products. It acquired Y Combinator startup Flightcaster for its talent and plans to hire about 100 more engineers in San Francisco, mostly mobile. They will work under Sandeep Gupta, Next Jump’s chief mobile engineer it nabbed from Yahoo last summer. Mobile shopping apps are going to be a huge area of concentration for the company this year. Next Jump CEO Charlie Kim derides most mobile shopping apps as either being meer extensions of websites (eBay and Groupon) or “built for the wrong audience—men not women.” He is looking to change that equation. Silver is a database cacher, indexer and searcher backed by the NoSQL database Redis and released by the tech team behind the political blog Talking Points Memo. It’s open source and was created in Ruby. It’s exciting to see a media organization not just using open source software, but also contributing. It’s not entirely unprecedented – the Lawrence Journal-World released Django, for instance – but it’s always appreciated. There has become a dichotomy in my home between the power haves and the power have nots. Try as I may, my every trip requires careful planning of packing of power cords, overnight charging of some devices, and continuous charging of others, via adapters in my car’s cigarette lighters or fruitful discovery of power outlets in restaurants, cafes, airport terminals and practically anywhere I can find them. To illustrate how obvious my issues are, one highlight of Christmas 2010 for me was my wife’s purchase of a dual USB charger for the car, so I could charge both my phone and a tablet at the same time. Yes, it’s that bad. On the good side of power consumption, one finds obvious winners. The iPads go days without needing to be charged, assuming only infrequent use. The Barnes and Noble NOOKColor holds its charge for more than a week’s time, if you are not reading every day. I’ve been absolutely comfortable taking Google’s Chrome CR-48 notebook with me without packing my power cord, and can see eight hours of continual use before searching for a solution, and the Samsung Galaxy Tab, so long as its brightness is not at the highest position, simply needs to be charged each night, after a full day’s work. In contrast, I need only look up every few minutes at my MacBook Air’s battery percentage to see the numbers slowly decrease. After a good two hours’ effort, even without streaming music or Flash games, I’m well under fifty percent. And the pain in terms of battery life for my Android phone (the Epic 4G) is as bad, if not worse, than my experience with the HTC Evo, and before it, my iPhone 3G. Even with all sorts of work to turn off WiFi or GPS when unneeded, and using BlueTooth only in the car, the phone seems to live a mere four hours, whether I use it or not – and I’m not even getting close to mentioning talk time. At CES, I even bought an external battery extender, that supposedly gives a charge and a half, but it too seems to serve only to make my phone hot to the touch before both die. The issues with keeping my phone up and running have become something of a laughingstock with friends who see the issues firsthand. Barak Hachamov, my partner at my6sense, sees my dance with electricity as we go meeting to meeting, and my wife knows I leave my phone plugged in at all times when I am not using it. There’s no doubt I would probably make more phone calls on the device, if I wasn’t constantly glaring at it sideways, or wondering why the battery seemed possessed. Trust me, I’ve been happy with Android from day one, and love it on my Galaxy Tab, but the Epic’s great keyboard hasn’t been enough to outweigh the battery problems and iffy GPS. It’s enough to have me asking every Googler and non-Googler I know how well their own Nexus S devices are working, to see if I should stomach an early termination fee (ETF) and switch again. The gulf between what I see as fantastic power managers like the CR-48 and the tablets versus my other laptop and my mobile phone experience is mind-boggling. On one hand, you see things that seem to run forever, while on the other, things are feeling like they are going backward, teasing me into thinking I should just marry up a simple feature phone for calls with a plan-free Android device that lives on WiFi. But that’s crazy talk. At a panel in the first half of 2010, I was asked about what I thought would be hot markets to invest in, and I quickly mentioned two places – the first being teleportation, and the second being true wireless power. I stand by those demands. If Google can build self-driving robot cars, surely there’s a department in the back finding a way to solve power consumption issues on Android phones, or finding unique ways to tap into static electricity, solar energy or something. Maybe I’d even accept a nuclear-powered laptop in exchange for going sterile. After all, with 3 kids under 3 already, I’m not exactly hurting for a full house. Power cords are a menace to convenience. Crappy batteries are significant hindrances to us getting the full capabilities out of our laptops, tablets and mobile phones. From my experience, the tablet manufacturers are doing a great job, and the CR-48 is a fantastic first volley into the less-demanding laptop sector. But if there’s any revolution I want to see in tech, it’s this one. No more widgets and doodads until you solve this very basic thing for me – for all of us. Please. The crowdfunding concept really seems to be taking off, especially with what Kickstarter has done to help fans fund creative projects. Now a startup called 33needs is bringing a similar approach to funding for-profit startups that want to tackle big, global issues. Founder and chief executive Josh Tetrick said that the company comes from his experience working for “a venture capital-like initiative” for the United Nations in Kenya while he was a law student. During that time, he said he met “hundreds of entrepreneurs” who had great ideas and valuable experience but didn’t have access to capital. “We are the only platform that enables ordinary people to invest, make a social impact, and earn a return,” Tetrick said. The company whose model comes closest to 33needs’ is probably profounder, a startup led by Kiva cofounder Jessica Jackley that launched in November and also offers a crowdfunding approach to small businesses and startups. Both services reward their investors with a share of the revenue from their companies. Asked about how 33needs differentiates itself, Tetrick pointed to 33needs’ emphasis in companies with a social or environmental mission, and the fact that it allows investors to participate in the potential “upside” from their investments. More than 895 entrepreneurs and nearly 1,000 potential investors have already signed up to participate in 33needs. Tetrick said his hope is to fund at least 30 startups in the next 60 days. Startup categories include “the planet”, education, community, health, opportunity, and sustainable food. Think mobile data demand is big today, with 94 million smartphone shipped this year and 5 billion mobile subscribers? 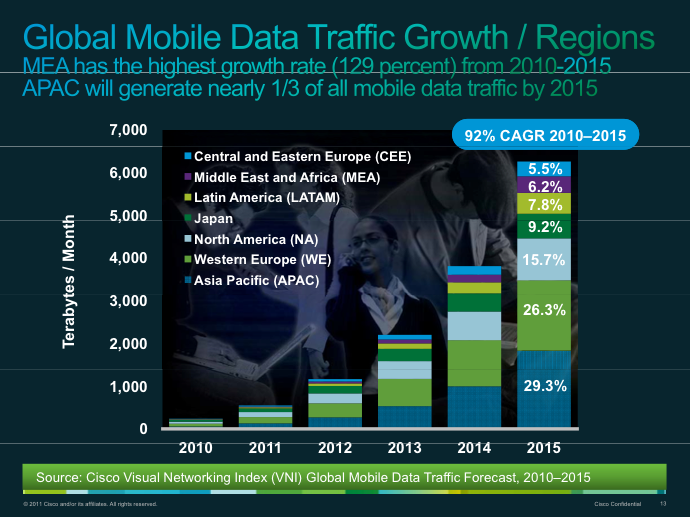 Well, Cisco ( s csco) says it’s going to get a lot bigger by 2015, with worldwide mobile data traffic set to increase 26-fold between 2010 and 2015, reaching 6.3 exabytes per month. That’s 75 exabytes annually by 2015 (What is an Exabyte?). Last year, I called it the mobilpocalypse, but this year, I’m going to say it’s a looming tsunami, driven by everyone’s favorite bandwidth hog — web video –and the proliferation of mobile devices. In short, we can blame this wave on Netflix on the iPad. 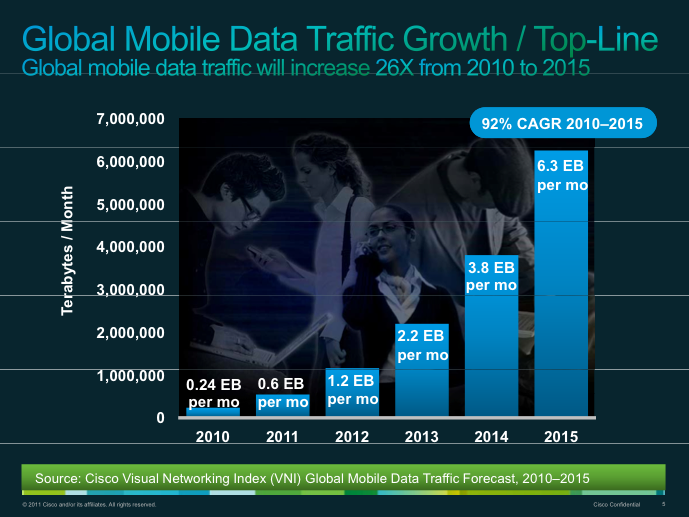 Cisco anticipates that in 2015, the average mobile user will consume 1,118 megabytes of traffic per month. For perspective, today the average mobile connection generates 65 megabytes of traffic per month, equivalent to about 15 MP3 music files. While the average growth is impressive, those megabytes will be spread across a wider number of devices, from tablets (big bandwidth hogs) to e-readers, which consume much less bandwidth, making it all the more significant. The Cisco study predicts that by 2015, more than 5.6 billion personal devices will be connected to mobile networks, and there will also be 1.5 billion machine-to-machine nodes — nearly the equivalent of one mobile connection for every person in the world. Cisco doesn’t give the current number of connections, but the GSM Association puts it at about 5 billion. 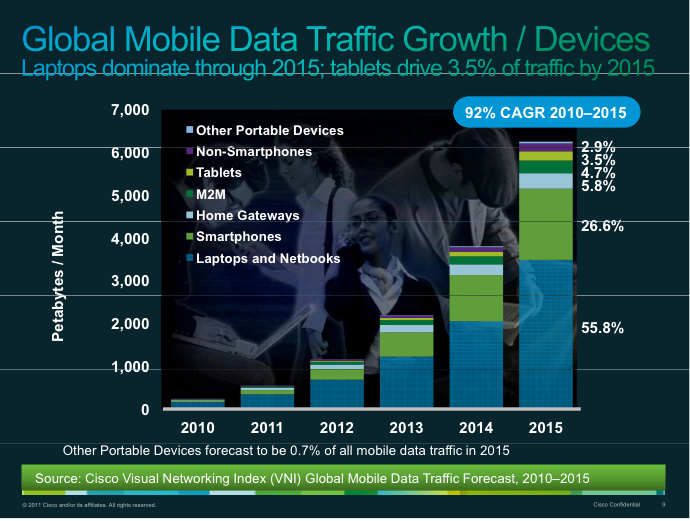 Cisco anticipates that mobile network-connected tablets will generate 248 petabytes per month in 2015 while machine-to-machine (M2M) traffic will reach 295 petabytes per month in 2015. The numbers are interesting because they are on opposite ends of the spectrum when it comes to data demand and profitability. Consumer video is in high demand thanks to devices such as tablets, but it’s also something operators are watching because they are worried it will clog their networks while not bringing higher margins. Meanwhile, much of the M2M connectivity will be small amounts of traffic, but extremely profitable. Operators are trying to cut back on data use, whether because their networks are overwhelmed or simply because they want to keep their nice margins on wireless data. However, that growth is still coming, and operators are undoubtedly trying to shape their customer base to ensure that a consumer-heavy subscriber portfolio doesn’t drag down their bottom line. So tiered pricing, pricing that ignores the reality of consuming more data at faster speeds, and possibly limits on what one can download in cheaper plans are all likely to make an appearance. 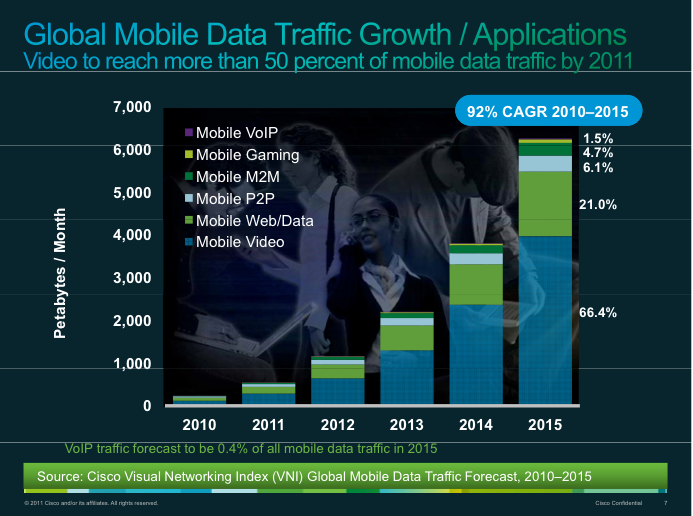 Mobile video is forecast to represent 66 percent of all mobile data traffic by 2015, increasing 35-fold from 2010 to 2015, the highest growth rate of any mobile data application tracked in the Cisco VNI Global Mobile Data Traffic Forecast. Mobile traffic originating from tablet devices is expected to grow 205-fold from 2010 to 2015, the highest growth rate of any device category tracked. Global mobile data traffic increased 159 percent from calendar year 2009 to calendar year 2010 to 237 petabytes per month, or the equivalent of 60 million DVDs. Global mobile data traffic grew 4.2 times as fast as global fixed broadband data traffic in 2010. Global mobile data traffic in 2010 was three times the size of all global Internet traffic (fixed and mobile) in the year 2000. Smart phones, laptops, and other portable devices will drive more than 87 percent of global mobile traffic by 2015. Stereoscopic 3D is the rage in TVs now, with more than half of the new TV models using the technology this year. And now it’s spreading to smartphones as well. South Korean electronics giant LG announced today it will unveil its LG Optimus 3D smartphone on Feb. 14 at the Mobile World Congress event in Europe. Hollywood is pinning its hopes on 3D as a technology that will revive interest in watching studio fare in theaters. Likewise, smartphone makers like LG see it as an additional feature that might help differentiate their wares in a highly competitive market. But consumer interest in 3D outside the cineplex is far from proven. LG’s new model will offer a “full 3D experience” to consumers “right in the palm of their hands,” LG said in its breathless but short announcement. The company says it addresses the lack of 3D content — one of the big problems holding back 3D — with a unique experience. The phone will also have a dual-lens camera that can record 3D images as well. The LG phone will not require users to wear clunky 3D glasses to see images in 3D. The phone will also have high-definition multimedia interface connectors so that you can display the 3D images on a bigger screen. LG’s announcement confirmed leaked images of the 3D phone that were posted last week. I will be interested to see if LG uses technology from MasterImage3D, which showed off good-quality 3D technology at the Consumer Electronics Show. So far, glasses-free 3D on a TV is a bust. It just doesn’t look that good. But it’s not as hard to make good-quality 3D imagery on a small smartphone screen. The question remains whether people really want to watch 3D on a tiny screen. Nintendo will launch its glasses-free 3D game handheld, the 3DS, in March. I think Nintendo’s device will have a lot of good games. But I’m not convinced that LG and other phone makers will know how to create compelling 3D for smartphone users. Earlier today, everyone was talking about Facebook and how it is “planning to launch a third-party commenting system in a matter of weeks.” The only problem, of course, is that Facebook Comments already exists as a plug-in for third-party sites. Facebook confirmed that it is “testing an updated plugin” on both its Facebook Blog and Developer Blog, as it has been for the past year. In that time, all these other real-time comment startups, such as Echo and Livefyre, have had time to prepare for the arrival of the 600 million member strong social network in the commenting space. So far, Facebook hasn’t managed to take over the commenting space and they had a few points to offer on why that’s the case. Chris Saad, VP of strategy at real-time commenting system Echo, mostly pointed to Echo’s upcoming launch event when we asked him how Echo had prepared for Facebook’s entrance into commenting, but also agreed that there were a number of areas he expected Facebook to fall short in. According to Saad, Facebook’s commenting system would likely not be real-time, wouldn’t allow for white labeling, wouldn’t allow any other party to own the data and would only allow for Facebook login. Beyond that, however, Kretchmer expanded on many of the contention points that both he and Saad expressed. “There will be very little or no shared ownership of comment data, and probably no plug and play database syncing for different CMS platforms. I’ve seen the rumors that Twitter and Google auth will be integrated, but my gut tells me that will require connecting those services back to your central Facebook account, which would defeat the purpose of allowing login through different social graphs in the first place. People generally want the option of commenting with different personas, not “anonymously” per se, but personas that they care about and upkeep in the different communities that they comment on. Not allowing for that will diminish the overall amount of conversation publishers will see. For example, I might have something meaningful to say about a controversial topic, but not something I want connected to my true identity. A quick look around the Internet also shows general user perception of a Facebook-only commenting system. People want to reserve the right to anonymity on the Internet and, if not this, then at least be able to exist as a separate persona from their true identity. Facebook can be credited for getting people to openly share this true identity on the Web, but they are still reluctant to use it all over the Web. What do you think – would you use a Facebook comment system on a third party site? Would you log in and leave a comment? Or would you shun the system and the site for other systems like Disqus, Echo or Livefyre? Let us know, anonymously if you’d like, in our Disqus-powered comments below. RentJuice, an online community that allows real estate agents and brokers to view rental data in real time is announcing its Series B round of $6.2 million in funding today, led by Highland Capital and esteemed Draper Fisher Jurvetson founder Tim Draper. While not consumer facing, RentJuice is still useful to consumers as it can provide a broker with up to the minute data on whether a given property is available, thus preventing inaccuracies. It gives brokers “one-click syndication” or the ability to automatically post properties to consumer real estate sites like Craigslist, Trulia and Zillow. RentJuice also offers premium accounts where users can upgrade to features that automate administrative work like lead gen, advertising and paperwork. RentJuice will also be using the money to expand its staff, and is currently hiring. This week, instead of a single API we’re spotlighting ReadWriteWeb contributor Pete Warden‘s new e-book Data Source Handbook, which was just released today. Pete covers a slew of data sources including, of course, many APIs. He’s made a list of services and a couple excerpts available here. If you’re a developer looking to supplement your own data tools and services, this concise ebook covers the most useful sources of public data available today. You’ll find useful information on APIs that offer broad coverage, tie their data to the outside world, and are either accessible online or feature downloadable bulk data. You’ll also find code and helpful links. By now you’ve probably heard of Google Voice, a service that lets you take one phone number and configure it to ring all of your phones — work, mobile, home, whatever — with plenty of settings to manage your inbound and outbound calls. But what if you wanted the opposite: a service that lets you spawn a multitude of phone numbers to be used and discarded at your leisure? That’s where Vumber comes in. The service has actually been around for four years, but it was originally marketed exclusively toward people on dating sites. The use case is obvious: instead of handing out your real phone number to strangers, Vumber lets you spin up a new phone number, which you then redirect to your real phone. Then, when your date reveals that he hates animals and has lived in his mother’s basement for a decade, you can simply deactivate the number. Around 30-40% of the service still caters to online dating, but Vumber can be used for other things. Cofounder Cliff Wener says that some of Vumber’s biggest customers are advertising agencies that use it to assign different phone numbers to regional ad placements in print media, so that they can track the response rate (this isn’t unique to Vumber — other firms that cater exclusively to advertisers offer similar features). Beyond these two examples, Wener says it’s tough to track down the more niche use cases, because the whole service is anonymous, and you don’t have to tell Vumber what you’re using a phone number for. But it’s not hard to come up with some creative ideas. The service works with just about any phone, and it’s now bolstering its smartphone presence to streamline its interface. An application is already available for iOS, with an Android app coming next month and SMS support on the way as well. Vumber isn’t the only service that lets you set up a secondary phone number — Line2, which we’ve covered before, does as well. But Line2 is really catering to users who just need one extra number, not a slew of them. Vumber costs $9.95 per month for your first number, with additional numbers available on a sliding scale starting at $3.95 (you can negotiate bulk discounts). Vumber raised $2.5 million in private capital before the company was acquired by video chat community Paltalk in November 2009 for an undisclosed sum. A new report from GlobalWebIndex has some thought-provoking data about "social entertainment," a term for when entertainment is augmented by social media technologies. For example, the real-time discussion happening around TV shows on Twitter. In the GlobalWebindex report, entitled GlobalWebIndex Wave 1-3 2010, author Tom Smith notes three main trends. The first two are well known: the rise of ‘real-time’ in consumer entertainment and the growth of what he terms "packaged platforms." By the latter, he means services that live outside of the browser – smartphone and tablet apps, gaming consoles, eReaders and Internet-connected TV sets. The third trend is more contentious. The report states that in the new era of social entertainment, traditional media holds the power – a change from the ‘web 2.0’ era, when the user ruled. The report argues that this will lead to a return to passive experiences by consumers. "Professionals are back in the driving seat when it comes to content," states the report. This, it says, will lead to the Internet eventually becoming the primary mass entertainment and content delivery platform. back to traditional needs and demands and seeking a more passive experience." The report explains that social entertainment is far more about content sharing, than creation. It goes on to suggest that this "light nature of interaction" is moving the consumer back to the passive state they were in before the Internet came along. Further, that services like Facebook and Twitter turn consumers into "distributors." I agree that traditional media is now finding a foothold on the Web, thanks to the rise of "packaged platforms" and social media sharing services like Twitter. I’d suggest though that this is still far from being the passive media consumer of old. These days, consumers are interacting with ‘professional’ content through their PCs, smartphones or tablets. They’re talking with peers and other people who are watching the same TV shows, in real-time. Or they’re watching a live music concert and talking with people on Facebook. Or they’re arguing in the comments of a news blog. They are analyzing content too, actively engaging in discussions about it. Even with books, a traditionally one-way consumption experience, readers nowadays can make notes about the book they’re reading and share that – via an eReader like Kindle or a service like Goodreads. While all of this is not as creative as recording a video or writing a blog, it’s not passive. Consumers are actively engaging with content. 16-24s are updating their social network on a daily basis," which is driving the "real-rime revolution." One other contentious finding of the report that is worth mentioning. It states that the browser – and the Open Web in general – will fade away and that eventually "packaged platforms" will rule. This is the same argument that Wired infamously brought forward last year in its The Web is Dead issue. The jury is out on whether the browser-based Web will be usurped by apps and other closed platforms. To me the far more interesting question that the report asks is: are we, as Internet consumers, becoming more passive? I’ve stated my response, that it’s not passivity but active and two-way engagement with content. What do you think? The social enterprise wars are heating up. Last week, Jive’s Tony Zingale came on to talk about a user survey that showed quantifiable value his customers were getting from Jive’s software and answer why Yammer and Salesforce get the bulk of the industry press. I invited Salesforce’s Marc Benioff and Yammer’s David Sacks on the show if they wanted to rebut anything said. Sacks took me up on it, bringing his own user survey, a funny video aimed at today’s Chatter launch, and some fighting words. Video sharing website YouTube has been highlighting video from the protests in Egypt for days, but tonight the official YouTube blog put up a post describing a number of steps it’s taking to make sure the world knows what’s going on in Cairo, Alexandria, Suez and elsewhere around that country. The Egyptian government is trying hard to black-out all media coverage of the huge protests challenging the three decade long rule of President Hosni Mubarak, but media is still getting out. YouTube appears to be doing what it can: every page on the site now has a banner pointing to the collection of Egypt protest videos, those videos are highlighted on the site’s front page and YouTube is streaming Al Jazeera’s coverage in English and Arabic. Imagine what would happen if Twitter and Facebook did something like this. It’s fitting of YouTube’s role in a rapidly transforming media world that the site is aiming the focus of its audiences directly at these important offline events. Twitter’s making it easier for Egyptians to Tweet by phone. Facebook is being used extensively by protesters for their own communication. Do you think it would be a good idea for Facebook to take official steps to draw the eyes of all the rest of its users to the conflict in Egypt? Does Facebook Need To Spend More On Lobbying? The social network has only had a presence in Washington D.C. for a couple of years, so we shouldn’t be surprised to learn that Facebook spent only $351,390 on lobbyists in 2010, a mere sliver of what competitors like Yahoo and Google spent. According to the U.S. Senate’s lobbying disclosure database, Apple spent $1.6 million, Yahoo spent $2.21 million and Google spent $5.16 million on lobbying in 2010. While these competitors have established lobbying operations, Facebook is still getting started. In the last couple of years the social network has hired high-profile policy experts to address issues like copyright, security of children online and online privacy. The work has occurred mostly in Washington D.C., although traffic and capitalization — depending on which rankings you’re referring to, of course — perhaps Facebook might need to invest more in lobbyist efforts in 2011. What do you think about the difference between how much Facebook spends on lobbying versus the competition? Here we go again: another impressive 7-inch Android tablet with a Gorilla Glass screen, 4G networking, and a suave interface. But is this thing more of the same or something new. The tried-and-true 7-inch tablet is, by now, old hat. In fact, little about the Dell Streak 7 is new except the clear emphasis on media playback and T-Mobile’s 4G wireless. On the aggregate, I’d say that this is a strong showing for Dell but does just enough to stand out from the current tablet crowd. Guess Who Microsoft’s Kinect is Making Rich? The success of Kinect, however, is having a bigger impact on a smaller company, which has been all but forgotten for nearly a decade – JDSU. The Milpitas, Calif-based company makes all sort of gear – from testing equipment to optical components. It is mostly infamous for being one of the biggest companies of telecom bubble that plunged from heavenly heights straight into demonic hell. It has merged, scrimped, scavenged and retreated through the past decade. Things aren’t peachy just yet, but it seems there is some hope for the company – thanks to the growing popularity of gesture technology. High-performance diode (light source) technology – illuminates a person from a gesture recognition system/3D camera/set top box and reflects data from the person’s movements back into the system. Optical coatings technology – filters out unwanted incoming data and allows only data from the person’s movements to be incorporated back into the gesture recognition system. The information about a person’s movements is mapped into a 3D image and then included in an application. This could be used in Kinect type gaming scenario or perhaps for navigating through menus of televisions and cable set-top boxes. The second example is particularly intriguing because as Internet and traditional television worlds merge, we will find discovery of content a big challenge, and beyond the scope of current remote controls. For now, Kinect is clearly the driver behind gesture technologies – Citibank Research estimates that Microsoft will ship about 19.2 million Kinect controllers over next 18 months. According to estimates from Mark Sue, analyst with RBC Capital Markets, a research firm, JDSU is bringing in about $4 per Kinect controller. JDSU’s Kinect connect hasn’t gone unnoticed – over past three months, JDSU stock has jumped nearly 70 percent, enough for analysts to issue cautionary notes. Still, the shift to these technologies is underway. It makes perfect sense – our interaction with digital information is getting more complex and we have to move beyond the mouse and text metaphor to be more productive. Microsoft clearly has made gesture based technologies an area of focus – it snapped up Canesta – a start-up that specialized in such technologies. It seems it will only be a matter of time before mobile handset makers and computer makers such as Apple start incorporating gesture-based technologies into their products. IP: PrimeSense, Optrima, Canesta (Microsoft), GestureTek, Softkinetic and Elliptic Labs. Could Microsoft still rule the living room?